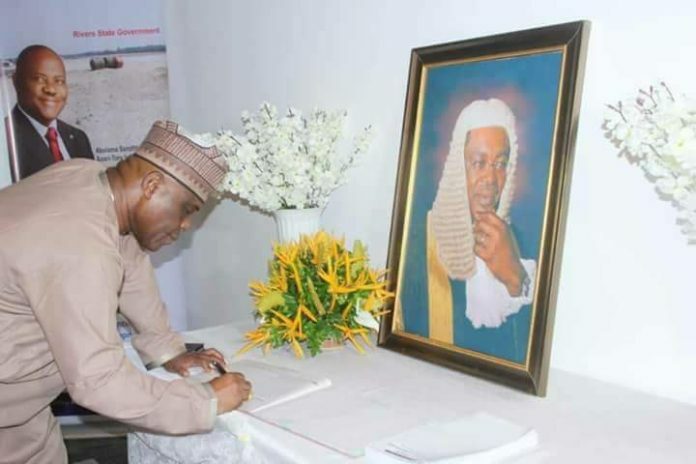 The Founder and Chairman Emeritus of Daar Communication Plc, Chief Raymond Dokpesi has described the Late Attorney-General of Rivers State as a patriot of the First Order. He also condoled with the Rivers State Government on the passage of the Attorney General of Rivers State, Late Emmanuel Aguma (SAN). Speaking during a condolence visit to Governor Wike over the death of the Attorney General of the at the Government House Port Harcourt on Friday night, Chief Dokpesi said the death of Aguma is a loss to the entire nation. Dokpesi said that he personally interacted with the Late Attorney-General of Rivers State and found him a committed public officer who diligently applied his intellect for the good of his people. “I personally had the opportunity to interact with the Late Attorney-General of Rivers State. He was intelligent and promoted the rule of law”, Dokpesi said. He said: “It is fit and proper to commiserate with the Government and people of Rivers State on the death of the Attorney General. Through Your Excellency, we also express our condolences to the family “. Responding, Rivers State Governor, Nyesom Ezenwo Wike said as Christians, the people of Rivers State have accepted the death of the Attorney General. He, however, noted that it will be difficult for his administration to find a replacement for the Late Attorney-General because of his loyalty, commitment to work and the rule of law. “This death is most unfortunate. What happened shocked us. I have never been shocked in this manner. As Christians, there is nothing we can do. God gives and God takes. “If there is anything that we could do save our Late Attorney-General , we would have done it”, Governor Wike said. The governor said that Late Emmanuel Aguma was so intelligent and dedicated that Rivers State never had any legal crisis under his watch at the Ministry of Justice. He said: “He was always assembling the best lawyers to defend the interest of Rivers State. It will be difficult to replace him”.